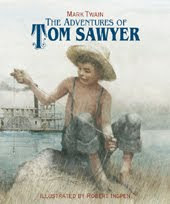 The Adventures of Tom Sawyer by Mark Twain, illustrated by Robert Ingpen. Sterling Books, March 2010. This is a lovely new edition of the classic book. It's a nice, large size and has beautiful, full-color illustrations. Linger by Maggie Stiefvater. Scholastic Press, July 2010. Oh, I *squeed* when I got this one in the mail. I was a big fan of Shiver, so I'm looking forward to checking out this sequel! Countdown by Deborah Wiles. Scholastic Press, May 2010. It's 1962 and it seems that the whole country is living in fear. When President Kennedy goes on television to say that Russia is sending nuclear missiles to Cuba, it only gets worse. Franny doesn't know how to deal with what's going on with her family and friends. But somehow she's got to make it through. The book calls itself a "documentary novel" and interspersed with the story are photos, ads, and other footage from 1962. I am in the middle of it right now and finding it completely intriguing. Trackers by Patrick Carman. Scholastic Press, May 2010. In today's landscape of bits and bytes, everyone leaves a digital footprint - even the most advanced cyber criminals. And that's where the Trackers come in - four tech-savvy kids armed with high-tech video cameras and esoteric coding skills. Told through an interlinked web of text, videos, and websites, this series follows Adam, Finn, Lewis, and Emily as they become entangled in a high-stakes game of cat and mouse with Shantorian, the world's most dangerous hacker. Big Nate: In a Class by Himself by Lincoln Peirce. Harper (an imprint of HarperCollins), March 2010. Big Nate is in a class by himself! Nate knows he's meant for REALLY big things. But life doesn't always go your way just because you're awesome. Trouble always seems to find him, but Nate keeps his cool no matter what. He knows he's great. A fortune cookie told him so. Big Nate is a syndicated comic strip and now it's being turned into a tween series. It looks (and is being publicized as) distinctly Wimpy Kid-ish. A ploy? Perhaps, but if it'll satisfy the Wimpy Kid fanatics at my library, more power to 'em. I shall report back. Another fabulous mailbox week (everyone at my apartment complex office knows me and whenever I go in there, they're always like "Another package?"). How about you? Oh you are a lucky reader! I've been hearing so many wonderful things about Linger! I hope you enjoy it!! And it looks like a wonderful bunch of books you've gotten this week! I loved Shiver and I have a feeling Linger will be just as good if not better. Trackers also sounds really interesting. I hope you enjoy all your books. Here is what's in my mailbox this week. I am so envious. I would love to read Linger before July. What do you think of the trend that Carman is taking part in? I will admit that I haven't read Skeleton Creek or Ghost in the Machine because of the extra work to visit the website and watch videos. I like reading to be simple and spur of the moment myself. Happy reading! I am really looking forward to Linger. The Tracker's loks interesting. The only other book I have red by Carmen is Atherton House of Power. I will have to look for this one after I reduce my huge TBR pile. Countdown looks interesting. At least it's historical fiction set in the 1960s, because the 70s and 80s can't be historical, can they?